I have had the joy of being is classes with some truly wonderful teachers. I got goosebumps in a class at Eurosynergy 2014 with Ronna Sarvas Weltman. She is such a generous, enthusiastic, encouraging teacher. On her website she says that helping students develop their voice is as much fun for her as creating her own art. And you can tell that when she teaches. I was already a little bit in love with Ronna but when I read this quote in her profile in Sage Bray’s Polymer Journeys: The Art and Craft of Polymer it was clinched. 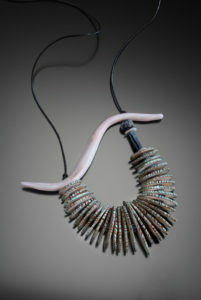 She says: I…think that our wearable art serves as little devices calling out to other members of our tribes so we can find each other and get all excited about our kindred soul connection. Sort of like a secret handshake, only more fun. As the wearer of the occasional whopping necklace (see below – borrowed bling) I could SO relate to this. As the woman who sometimes notices jewellery before she notices faces, I knew what Ronna meant about that kindred soul connection. I liked that she mentioned tribes! There is a real sense in which we sense the sisterhood by the wearable art!. 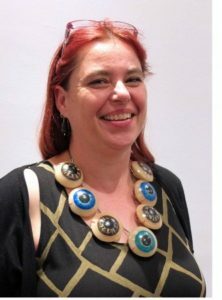 At polymer gatherings, there is a tendency to frankly stare at one another’s chests and this was gently mocked by Anke Humpert who wore eyeballs that stared back! Thanks again to Sage Bray for letting those of us who couldn’t get to Bordeaux in on the joke through the pages of her The Polymer Arts blog! This entry was posted in Uncategorized and tagged Anke Humpert, Polyme Journeys, Ronna Sarvas Weltman, Sage Bray, The Polymer Arts blog, Tribal jewelery on July 30, 2016 by wendy.